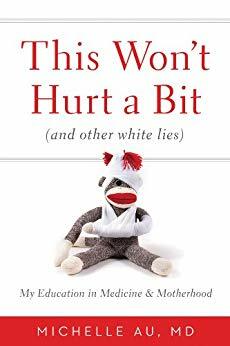 In her book This Won't Hurt A Bit (And Other White Lies): My Education in Medicine and Motherhood, Dr. Michelle Au provides deep insight into the life of a woman, who is a physician in different stages of training, a mother of two children, and a refreshingly normal person. Dr. Au is currently an attending physician of anesthesiology in Atlanta, Georgia and well-known for her blog The Underwear Drawer. She grew up as a daughter of two doctors in New York City, graduated from Wellesley College and Columbia University of Physicians and Surgeons, and completed her residency in 2008. Her book tells the story of her life, which is far more than a simple biography. Dr. Au takes the reader on a very personal journey with all the experiences, thoughts and questions everyone of us has during medical training. This book is her attempt to find answers. Dr. Au manages to depict her development as a doctor and a person in a very entertaining manner. After the "Apologia," every chapter describes an episode of medical training (Preclinical, Clinical Practice, Pediatrics, Anesthesia, etc. ), her experiences, and what she learns from them, personally and professionally. She tells many private stories, for example how she met her husband in medical school and what it means to handle two medical careers, marriage, pregnancy, and parenthood. The clinical encounters with her patients are no less challenging. Consequently, there are often situations with a matter of life and death ethical questions and issues regarding the system. Of course, there is the ultimate question: Why become a doctor? Why is anyone in their right mind willing to give up most of their time (and maybe life) for studying and sleep deprivation? Why is work always the first thing a medical professional thinks about? Does it make sense that someone has to take care of your child while you are in the hospital taking care of strangers? At last, why are there no lactation suites in an adult hospital for the staff? Dr. Au's book is so refreshing because she is not afraid to name common fears or realizations every one of us has at least once in our lifetime (e.g. that not everything that happens in the clinic can be prevented and not everything is our fault). Fortunately, she does not take herself too seriously, which gives the reader an authentic impression. Her stories live on her first-person narrative, colorful descriptions, real-life experiences and honest thoughts. The way she deliberates her ideas enables her to find comprehensible answers to her questions. In conclusion, I recommend this book to patients, medical students, and everyone who is curious to learn something about the challenge called medical training. I doubt it could serve as guidance for colleagues who are already beyond the point of juggling family and career. Nevertheless, it is entertaining and offers new perspectives. From my personal point of view, every patient would profit from reading this book because it gives an inside on what is going on after we put on our lab coat. Furthermore, every medical student should read it because it gives you a glimpse for what happens after finishing medical school. To say it with Dr. Au's words, "we grow into our white coats. We learn how to be the doctors that our patients need us to be without losing the essential humanity that brought us here in the first place."